Northwest Georgia: Ringing in the New Year with Results! With around $55 million in assets and two branch locations, Northwest Georgia Credit Union proves that savvy marketing and results-driven campaigns don’t just belong to the big boys. In early 2010, Third Degree teamed up with the credit union to work on its brand position. (Check out VP, Creative Director Tara Street’s blog post showing the creative elements. 3. Increase the amount of member services utilized per household. The results? In 2010, Northwest Georgia saw a 1.6% increase in membership, a 56% increase in annual loan volume, and 1.6% increase in member services utilized by household. Mission(s) accomplished! 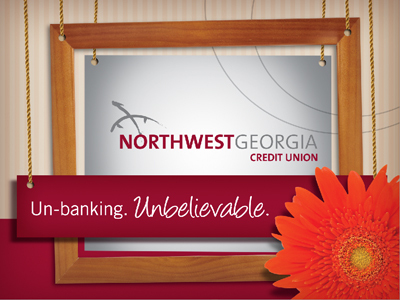 With the new brand up and running, Northwest Georgia and Third Degree then collaborated on a mid-year auto loan campaign. After great success with high-yield checking in recent years, the credit union needed to increase its lending (like many credit unions around the country). Starting the third week in July and ending in November, this program saw some big results. Northwest Georgia exceeded its loan goal by a whopping 82%. Plus, the auto loan campaign had a residual effect of drawing attention to the credit union’s overall lending product portfolio which led to a 25% increase.